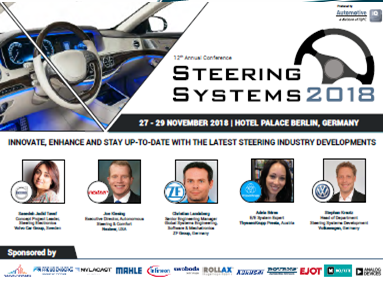 If you are involved in the development of steering systems, join experts from ThyssenKrupp Steering, Volvo Car, Hyundai Mobis, Jaguar Land Rover, Volkswagen and many more from 27-29 November 2018 in Berlin, Germany. • Participate in interactive sessions focused on strategies for steering autonomous vehicles. • Meet other experts from around the globe to explore the latest developments on steer by wire systems. • Learn how other steering professionals are adapting to new consumer demands, while ensuring safety and cost efficiency. • Engage in sessions that tackle challenges with current Electric Power Steering systems. • Benefit from the co-location sessions of the 12th Intelligent Braking Conference and network with experts that share the same interest as you.